In 1966, the Dodge Charger was introduced as a two-door fastback sedan that shared components with the Coronet and the Chrysler B platform. This model would come to be known as the first generation Charger. Over the last 50 years, it has changed dramatically, now in its seventh generation, looking nothing like it once was. The seventh generation of the Dodge Charger has an improved interior and exterior styling, including side scoops along all of the doors, angular headlights, a new grille, and overall a more aerodynamic shape. When the seventh gen Charger was originally released in 2011, the Charger had a 3.5-liter V6, but in 2015 Dodge added three new V8 engine options to the Charger lineup. For the 2016 model year, the Charger lineup consists of four engines — a 3.6-liter V6, 5.7-liter HEMI V8 engine, and two SRT-tuned engines, the 6.4-liter HEMI V8 and the supercharged 6.2-liter HEMI SRT Hellcat V8 engine. “SRT” stands for “Street & Racing Technology” and it is a special brand within Dodge that focuses on performance vehicles. Of all these engines, the supercharged 6.2-liter HEMI SRT Hellcat V8 engine is the most powerful. This engine generates 707 horsepower and 650 lb-ft of torque and when it is in the Dodge Charger, it makes the Charger the most powerful and fastest sedan muscle car in the world. However, SRT didn’t just stop with the engine. They spent many hours equipping their Charger SRT Hellcat with top performance parts and making its body as aerodynamic as possible. As noted, the Dodge Charger Hellcat is powered by the supercharged 6.2-liter HEMI SRT Hellcat V8 engine. It is related to Chrysler’s 6.4-liter and 5.7-liter HEMI engines, built with similar dimensions but integrated with charge coolers to deliver compressed air into the intake of the engine with 11.6 PSI of boost. This resulted in the 707 horsepower, 650 lb-ft of torque, and a top speed of 204.55 mph. When the Hellcat was first being developed, Dodge’s product development team had two goals: making the fastest muscle car ever, and still having worthwhile fuel economy. Today, the fuel economy of the 707-hp Dodge Charger Hellcat is 22 MPG on the highway. All of that power and speed claimed the record for the fastest car to come from Dodge, going from 0-60 mph in 3.4 seconds. That’s 0.3 seconds faster than the Challenger Hellcat, and 0.5 seconds faster than the Challenger Hellcat with Manual transmission. It’s also 0.1 seconds faster than the 2017 Chevy Camaro ZL1 and 1.9 seconds faster than the 2017 Ford Mustang V6. The Charger SRT Hellcat also covers a quarter mile in 11.0 seconds flat. That’s 0.8 seconds faster than the Challenger Hellcat and 0.4 seconds faster than the 2017 Chevy Camaro ZL1. 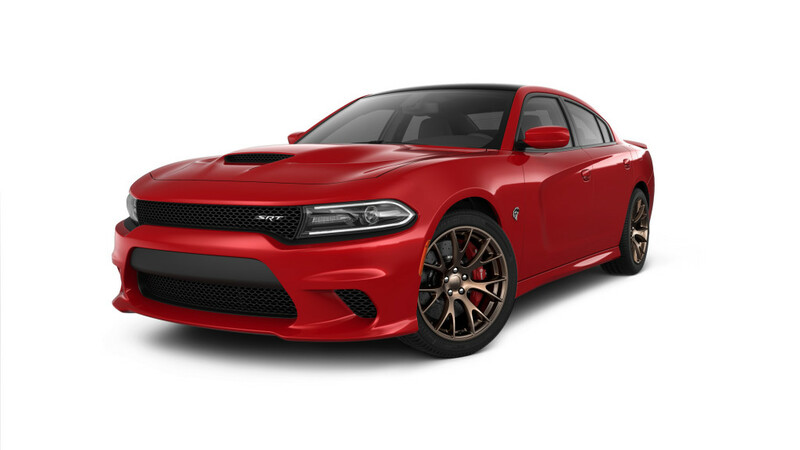 Part of the Dodge brand, it needs Dodge style, and the Charger SRT Hellcat is full of Dodge’s heritage styling, from its iconic design to its crosshair grille. Although dual carbon stripes are optional, most would think there’s a need to remind onlookers this is a muscle car. Around its body, one can find the SRT Design Badge, the SRT Hellcat Exterior Badges, and the SRT Nameplate Badge. Something with this much attitude and power needs to be able to stop on a dime; the Charger SRT Hellcat has ultra-high performance brakes by Brembo with ABS making up its braking system. For added performance, it rides on 20-inch SRT Matte Black Lightweight Forged Aluminum Wheels, and a dedicated cold air intake and dual air extractors have been integrated into the hood. It’s available in eleven colors, including HIP Legacy colors, such as TorRed and Go Mango! Although a muscle car, the Charger SRT Hellcat comfortably seats up to five passengers. All of the seats are heated, the front seats are ventilated, and they’re all covered in leather trim. On the seats themselves, a Laguna Lux Perform SRT Logo can be found embossed into the material. The interior is available in black, a black/ruby red combination, and a black/sepia combination. Six premium speakers make up the audio system, complete with HD Radio and a media hub. Uconnect 8.4 NAV and Access are included, with all apps found and controlled through an 8.4-inch touchscreen display. Drivers will find a 7-inch configurable instrument cluster on the dashboard, will be greeted by a heated steering wheel, and can enjoy the luxury of automatic dual zone A/C temperature control. As always, Mopar has a strong relationship with Dodge, and many parts to increase the performance of the Dodge Charger SRT Hellcat can be found in their catalog. A cold air intake system is already installed, but if you’d like better exhaust and oil filters, want to exchange the suspension, or simply install some upgrades, Mopar has you covered. A strong muscle car is not without strong safety features. The Charger SRT Hellcat has an advanced multi stage airbag system, active head restraints, blind spot and cross path detection, a ParkSense rear park assist system, a ParkView rear back-up camera, LATCH ready child seat anchors, and more. For security, it has a a Sentry Key Theft deterrent system and security alarm. Pricing for the Dodge Charger SRT Hellcat starts at $67,645. It has the standard Dodge warranties – basic 3-year or 36,000-mile warranty, powertrain 5-year or 60,000-mile warranty, rust-through Coverage for 5 years or 100,000 miles, and roadside assistance for 5 years or 100,000 miles.